I didn’t explore Aurora as a brand that might seriously interest me until last year. Sure, I’d previously reviewed a few pens on loan from Kenro, the Aurora distributor, or that I’d borrowed from friends, but I hadn’t invested any of my own resources in the brand. That changed when I acquired the “Black Ops” Talentum released last year. Since then, I’ve picked up a few more, including an 88 Sigaro Blu, an 88 Minerali, and this year’s “stealth” release, the 88 Unica Nera. The trim on the Aurora 88 Unica Nera and the Talentum Black Ops is quite different. I like them both, but I might prefer the lighter “gunmetal” look. The Unica Nera is a natural follow-up to two other pens already in Aurora’s lineup, the Aurora 88 Satin Black, and the 88 “Ottantotto” demonstrator. Aurora’s latest combines the matte black barrel of the Satin Black with the Ottantotto’s black-plated trim. The result should please fans of “stealth” or “blacked out” pens, and on the whole the Unica Nera is a great pen, but there are a few nits that I think are open to critique. A size comparison between the Talentum Black Ops and the Aurora 88 Unica Nera. The pens are actually close to the same size, but the Talentum feels bigger due to the larger cap. What Do I Like About The Unica Nera? Like the Aurora 88 Satin Black, it’s a lightweight pen, despite being a piston filler. The Unica Nera is also well-balanced, and I could write with this pen all day posted. I say posted because the Unica Nera is so light that I need to post the cap as a counterweight. The cap posts deeply and doesn’t make the pen too long. The matte finish on this pen looks impeccable and the texture feels great in the hand. There are no no injection molding lines or visible flaws in the finish on either the cap or the barrel. The Aurora 88 has a very large ink capacity, and the piston turns smoothly without sticking. Aurora pistons can sometimes be difficult to flush clean, but I’ve changed inks in this one a couple times with no issues. The Unica Nera features the same 14k plated nib as the Talentum Black Ops, and in my case, both are fine nibs. The fine nib in my Unica Nera writes a much finer line than my Black Ops, despite having the same nib designation, though it writes smoothly and with perfect ink flow. In my experience, Aurora nibs have some variability in terms of line width (they’re made in-house), and are known to write with a bit of “tooth.” In a couple of cases, I’ve found the “toothiness” to cross the line into “scratchiness” due to ever-so-slight misalignment of the tines, though I’ve always been able to fix the issue with nothing more than a loupe and my fingernail. Both of these nibs are black-plated fine nibs, though one writes much finer than the other. The Talentum nib is more of a medium. The Unica Nera is an extremely lightweight pen. Part of me wishes that this one had a bit of additional heft to it. Sometimes when I’m writing with this pen I find myself thinking that it’s just a touch insubstantial. The matte black clip and the shiny black cap band don’t match. This could be a design choice, where Aurora tried to add some contrast to a pen that would otherwise be one-dimensional, but I’d rather see them do this by varying the tone of the plating on the trim, which brings me to…. I prefer the look of the trim on the Talentum Black Ops, which has a more traditional ruthenium/gunmetal tone than the plating on the Unica, which appears to be identical to the trim used on the “Ottantotto” black demonstrator. All three pens use the same nib, which has the gray/gunmetal hue. I like pens with ink windows. Here, the Unica Nera is showing off some Robert Oster FIre & Ice. Ever since I published my initial piece on the Talentum Black Ops, I’ve had to field questions about the durability of the trim, and I will answer them here: No, I’ve not had any issues with the trim wearing off the clip, cap band, or any other areas. I did hear that there was a bad batch of pens with defective trim that I believe went to Europe, which caused a delay in the Black Ops’ global release, and some of those pens might remain in circulation, but I’ve personally had no problems. In general, I’ve had good luck with the trim on my stealth pens, including not only the Talentum but also my Sailor Pro Gear Imperial Black and Sailor 1911 Black Luster models. Some people are tired of the “all black” look, but I’m not, especially where it’s well-executed. These understated workhorses are pens that I can use all day at the office, and look great without drawing unwanted attention. I’ve been using the Unica Nera at work for the past couple of weeks, and can confirm that it’s a lightweight, easy pen to write with for extended periods of time, and sports a firm fine nib that’s I’ve enjoyed using for planner notes and annotation. If you don’t have a black trim pen in your collection, the Unica Nera is definitely worthy of your consideration. These pens are relatively new, and therefore still making their way to most retailers. Pen Chalet currently has them in stock, priced at $585, which is around the typical price point of an Aurora 88. The Unica Nera is slightly more expensive than the Satin Black but far less expensive than the Ottantotto demonstrator. 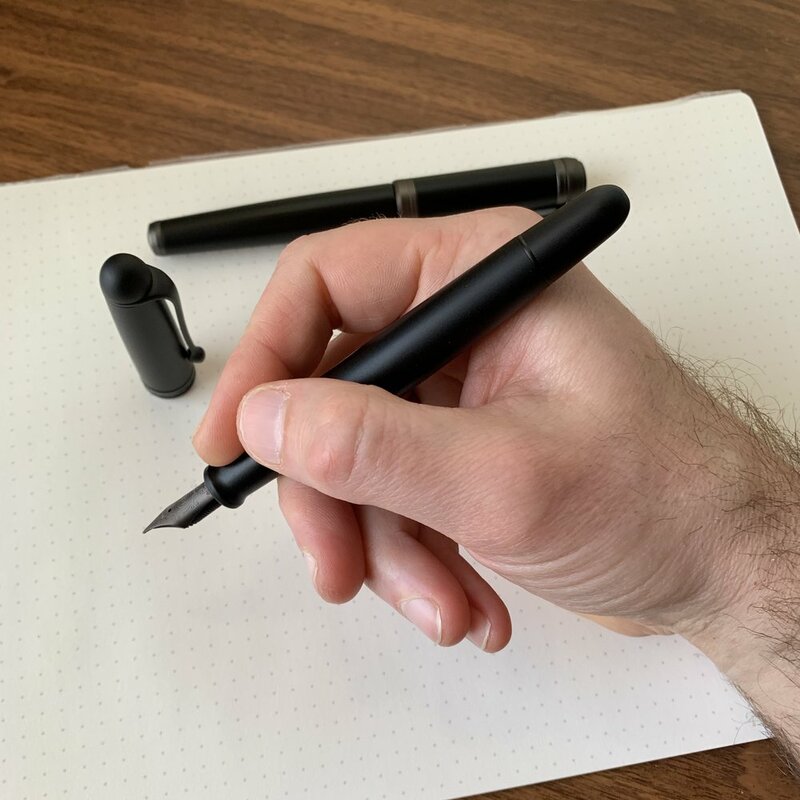 Disclaimer: I received the pen featured in this review directly from Kenro Industries, Aurora’s North American distributor and a sponsor of this blog, and paid with “store credit” that I received in exchange for sidebar advertising. This post contains affiliate links.